A big thanks to all of our loyal readers for spreading the word! Not only did we cross the mark of more than one million pageviews (1,016,500 as of today), we've had more than 115,000 hits in October alone! We've come a long, long way since we started in June of 2009. We encourage all of our new readers to start with the basics before moving on to other topics. You may want to begin with our overviews on your baby's cues, crying, and sleep patterns. A few weeks ago, the news was full of stories about a long-term follow-up study that was used to see if a sleep intervention, started when infants were about 8 months old, had long term-effects (positive or negative) on babies, moms, or their relationship with each other. The authors' conclusion was a simple one; there was no long term effect on any of their measures. Hardly earth shattering stuff. But in this case, the lack of an effect was big news. In the original study (published in 2007), the authors reported that mothers in the intervention group reported fewer infant sleep problems and had better scores on a common depression scale (used at 10 and 12 months postpartum). Given that their study found no evidence of harm to the child 5 years later, the authors and the press concluded that "cry it out" methods of sleep training were safe and beneficial for parents who want to use them to get more sleep. Our loyal readers already understand our bias. We don't like sleep training and we have certainly heard from those of you who do! Ok, so you're thinking who is right here? Which point of view does this research support? Unfortunately, neither. In this post, we'll take a closer look at this work and discuss what it does and doesn't tell us. Maternal child health nurses in Melbourne, Australia were trained by the authors to provide sleep management support for mothers who reported sleep problems in their 7-month-old infants. Mothers were randomized (based on which clinic they attended) when their babies were 8-months-old into an intervention group that received the sleep management support or a control group that received standard care. The sleep management support included an assessment of the mothers concerns and an individualized sleep plan (education, handouts, and a choice of behavioral methods including "controlled crying" or "camping out"). Using "controlled crying" meant that babies were put in their cribs and allowed to cry until they fell asleep but parents were encouraged to go in periodically and console their babies, gradually increasing the intervals in between visits. Using "camping out," meant that the parents sat with the baby until the baby fell asleep but gradually reduced the time in the room over 3 weeks. Of the 174 families in the intervention group, 60 or about 34% chose to use one of these "cry it out" methods. At 10 and 12 months, the mothers were asked to answer a questionnaire about their babies' sleep and to fill out a screening tool used to identify depression. Moms in the intervention group were less likely than moms in the control group to report that their babies had sleep problems at 10 and 12 months and they had better scores on the depression screening questionnaire (meaning they were at lower risk for depression). Follow up studies at two years showed that those depression scores were still better in the intervention moms even though there were no longer differences in the perception of sleep problems in their toddlers. After 5 years, the authors found no effect (good or bad) of the intervention on any measure. 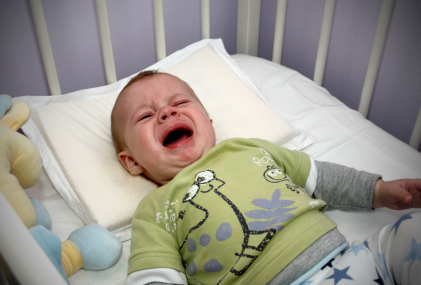 Reporters picking up on the story reported that this research proved that cry-it-out methods were effective and safe for babies (because they had no effect 5 years later). And many parents who had used one of these methods (and people who make their living sleep-training) were deeply relieved. But there is another perspective...while the cry-it-out methods were part of this intervention, the researchers were really testing the benefits of health nurses offering invidualized sleep plans for parents who perceived their 8-month-old babies were having sleep problems. Only about a third of the families used the cry-it-out methods but 93% of the moms reported that it was very helpful to have someone to talk to about their concerns. Because of the study design, the real finding is that health nurses' support was safe and beneficial to the families, at least in the short term. By the time the children were 5-years-old, there was no difference between groups. We need to keep in mind that the families had other options to choose from for their indidualized plans (including using routines) and they received education on what could be expected as normal. Because the authors used the mothers' perceptions of sleep problems rather than objective measures of infant sleep, the explanation of what was normal could have in itself influenced this measure and reduced the mothers' stress. These were important features of the intervention that didn't show up in the news. So what does all this mean? In our view, this study confirms that families need support throughout the first year (and beyond) in dealing with the stressful parts of their babies' behavior. Importantly, it also shows that moms who are not supported may be more at more risk for depression. But, this study does not provide evidence one way or the other specifically about cry-it-out methods since there was no randomization of those methods to one group or the other. We know that this is a passionate issue for a lot of families. Whatever your feelings about sleep training, we hope that we've helped you better understand what this recent work does and does not teach us. Hiscock H, Bayer J, et al. Improving infant sleep and maternal mental health: a cluster randomised trial. Arch Dis Child 2007; 92: 952-958. Hiscock H, Bayer JK, et al. Long-term mother and child mental health effects of a population-based infant sleep intervention: cluster-randomized, controlled trial. Pediatrics 2008; 122: e621. Price AMH, Wake M, et al. Five-year follow-up of harms and benefits of behavioral infant sleep intervention: randomized trial. Pediatrics 2012; 130: 643-651. Wake M, Price A, et al. Does an intervention that improves infant sleep also improve overweight at age 6? Follow-up of a randomised trial. Arch Dis Child 2011; 96: 526-532. Perception: Tummy time needs to be scheduled into the day. This was probably the most common misconception I saw during my search. Maybe it is because the term “tummy time” implies that it should be done at a certain time of day or for a certain amount of time. Or maybe it’s because many of the sources of advice suggest spreading it out over the day and aiming to get in some tummy time each day. Clarification: Regardless of the reason for the confusion, we’d like to assure you that we are not suggesting that you pencil tummy time into your calendar or to do list. The term “tummy time” was made popular during the Back-to-Sleep Campaign, a nation-wide effort to reduce deaths from Sudden Infant Death Syndrome by teaching parents to put babies down to sleep on their backs (click here for a previous post campaign). As a way to help parents remember to put their babies down on their tummies while awake (but not asleep), health care providers used the term “tummy time” and slogans like “back to sleep, tummy to play.” It is possible that some parents found that incorporating tummy time into a routine helped them remember, but there is no evidence that babies need to be put onto their tummies at the same time every day and we found no recommendations for the number of “tummy times” or total minutes babies absolutely need. Perception: The tummy time recommendation is the only physical activity recommendation. Several of our readers seemed to think that we were suggesting that tummy time was the only alternative to being in a car seat, bouncy chair, or stroller. Clarification: Just like adults, babies need to move to be healthy (see one of our early posts, For Babies, A Little Playtime is a Great Workout). After being confined to their mom’s bellies for so long, even just stretching is great exercise for your baby. Babies need a lot of time to stretch, not just on their tummies, but on their backs too. Car seats are great for car rides and strollers are great for walks, but having their arms and legs free to move and stretch, being able to turn and raise their heads, and wiggling and twisting their bodies is how they get stronger and prepare for more complex movement. Perception: Tummy time is not necessary if a baby is carried in a sling. Some of our readers mentioned that wearing your baby in a sling provides the same benefits as tummy time and therefore, “baby wearing” could replace tummy time all together. 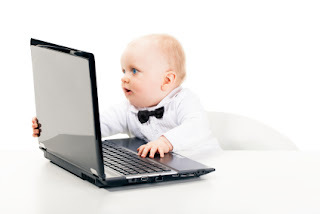 Clarification: First, I’d like to mention that the similarity between tummy time and baby wearing was new to us, so we searched for studies to share with our readers. We didn’t find any research articles, so if you have any you’d like to share with us, we’d love to take a look and possibly write a future post on them. There is no question that holding your baby, in a sling or just in your arms, is very important (click here and here for a 2-part series on slings). Having close contact is beneficial for mothers and babies. But, like we mentioned before, babies need to develop their muscles, and to do that, they need to be able to move around in a variety of different positions. While many slings allow some flexibility for the baby to move around, some do not, and when it comes to muscle development, free movement is key. Clarification: Studies show that tummy time has several benefits. It does help to prevent plagiocephaly, the technical term for “flat head syndrome,” but it also strengthens muscles in the jaw, neck, shoulders, chest, and arms. Also, health professionals have observed an increase in motor development delays corresponding to a decrease in the amount of time babies spend on their tummies. We’d like to thank everyone who emailed, commented, or posted on Facebook in response to our tummy time post. We hope the information above provides a clearer picture of what tummy time means and why it is important. We recognize that every baby (and family) is different but the bottom line is that babies need time and space to stretch, push, twist, and turn. No baby should be bundled up, buckled up, or on his back or on his tummy all the time. Just like adults, babies need a variety of movement to stay strong and healthy. American PhysicalTherapy Association (2008). Lack of time on tummy shown to hinder achievement of developmental milestones, say physical therapists. .
Majnemer A, Barr RG (2006). Association between sleep position and early motor development. The Journal of Pediatrics 149:623-29. Monson RM, Deitz J, Kartin D (2003). The relationship between awake positioning and motor performance among infants who slept supine. Pediatric Physical Therapy 15, 196–203. Stein MT (2007). 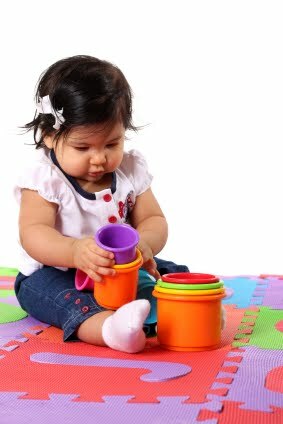 Infants need daily “tummytime” for early motor development. Journal Watch Pediatrics and AdolescentMedicine. Over the last few weeks, we have been getting more and more comments and emails from our readers. While we always encourage questions, feedback, and topic ideas, we want to take a few minutes to remind everyone about what kinds of information we can and cannot provide through this site. We would like to help our readers in any way possible, but we feel it is important not to provide information that we are not qualified to give. We are not medical doctors, we are researchers. Also, there are many issues that require in-person consultation, which is not possible given that we have readers all over the world. If you have a question and are unsure if it is something we can help with, please send us an email. If we can provide answers and support, we will. If it is something that we feel needs more personalized or medical attention, we will let you know. Whenever you are concerned about your baby's immediate help, call your medical provider.